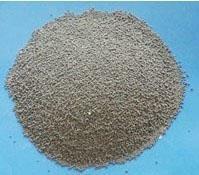 oil fracturing proppant has been used more and more widely to replace the glass balls, quartz sand and etc. To increase and maintain production throughout the life of oil and natural gas wells, ceramic proppant plays a significant role in the field of low-permeability fracturing exploration. As a substitute of glass ball and metal globule, ceramic proppant has excellent performance due to reliable features of high temperature resistance, high strength, good conductivity, crush resistance and erosion resistance. It is also an environmentally friendly product. When in process, proppant transported by fluid is to fill the low permeability of the rock deposits in the crack, which creates a permeable channel. It allows the hydrocarbons flow more freely, thereby increasing both production rates and the amount of oil or gas actually recovered from the well. Many cases have been proved that by using ceramic proppant not only improve 30%-50% output of production, but also can extend the service life of wells. Zutel fracturing proppant adopting high quality bauxite and unique techniques is manufactured by well grinding mixed with various additives, and then pelleting. According to the tests by Frac Tech Laboratory and Reservoir Stimulation Laboratory of RIPED-Langfang Petro China, our products are all reached the criteria of SY/T5108-2006. Meanwhile, our product has been met the standard of API RP-60 by Stim-Lab United States. Zutel Ceramic Proppants is your first choice for high hydraulic fracturing application in oil and natural gas industry. Light weight, medium density and high density. 6/12 mesh, 8/16 mesh, 12/18 mesh, 12/20 mesh, 16/20 mesh, 16/30 mesh, 20/40 mesh, 30/50mesh, 40/70mesh, 70/140mesh, etc. Additionally, our company can produce products with different specifications upon requests.